Before the Trans-Siberian was built, the journey from Moscow to Vladivostok took at least 11 months. Historian Alexey Volynets talks about how Russia, which feared Chinese expansion towards its Far Eastern territories, decided to build the Trans-Siberian Railway 125 years ago. RBTH have compiled a list of the most popular online search queries related to Russia. In a series of articles titled ‘Why Russia’ we'll answer each and every question. By 1890, the European part of Russia had a railway network that spanned almost 30,000 kilometers, thanks to an effective system of public-private partnership. Meanwhile, east of the Ural Mountains that separate Europe from Asia, there wasn’t even a single kilometer of railway tracks, even though Emperor Alexander III vouched for it. In 1886, he said, "the government still has done nothing to meet the needs of this rich, but frontier region." The idea of a railway project from Moscow to the Pacific Ocean seemed unreal. As the construction of the 650-kilometer St. Petersburg–Moscow Railway (open in 1851) cost 67 million rubles (when the government had annual revenues of 200 million rubles), to connect Moscow with Vladivostok would have cost at least 330 million rubles (about $7 billion today). Meanwhile, after the Crimean war (1853-56) drained Russia’s resources, the coffers were empty. Another factor that scared the government was the fact that the Trans-Siberian was to be built across almost unpopulated Siberia, crossing hundreds of big and small rivers. So the bureaucrats responded to Alexander III by saying that the construction was not possible. No one knew that within just a few years there would be developments that would outweigh the fear of exorbitant costs. In July 1890, St. Petersburg was hit by the alarming news that China began to build a railroad to periphery of the Russian Far East. It was only in the mid-19th century that Russia was able to conclude a number of agreements with the Qing Dynasty that gave the Russian Empire the land that now comprises of the Amur Region, Primorye Territory, Sakhalin Region, Jewish Autonomous Region and a large part of the Khabarovsk Territory. At that time the railroad ended at the Urals. From there onwards, there was only a horse track that stretched across Siberia. Vladivostok could be reached from Baikal by ships on the Shilka and Amur rivers. In the winter, when the Amur was frozen, or in the summer when it was drained, regular communication was interrupted. This road journey took at least 11 months. The alternative was the sea-route around India, China, Korea and Japan. The journey took up to six months, but any potential conflict between Russia and Britain, China or Japan immediately would cut off the Far East from European Russia. Actually the Russian Far East at that time was very much "an island” cut off from Russia. The isolation of its Asian territories is why St. Petersburg was scared when in the summer of 1890 it learnt about China’s plans for the construction of a railway to the periphery of the Russian Far East. China with the help of English engineers began to lay its railroad from Beijing to the North, to Manchuria and onward to the city of Hunchun, located at the junction of three countries: China, Russia and Korea, just 100 kilometers from Vladivostok. Curiously enough, the proposed Chinese railway from Beijing to the north, which scared Russia so much, was built several decades after the Trans-Siberian. At that time China had 400 million inhabitants, and the Russian regions bordering the country had a population of less than two million. In August 1890, the Russian Empire’s Foreign Minister Nikolay Girs said the construction of the Trans-Siberian Railway was "of paramount importance." Geopolitics won over financial considerations, and Alexander III instructed Crown Prince Nicholas to personally oversee construction of the railroad in Vladivostok. 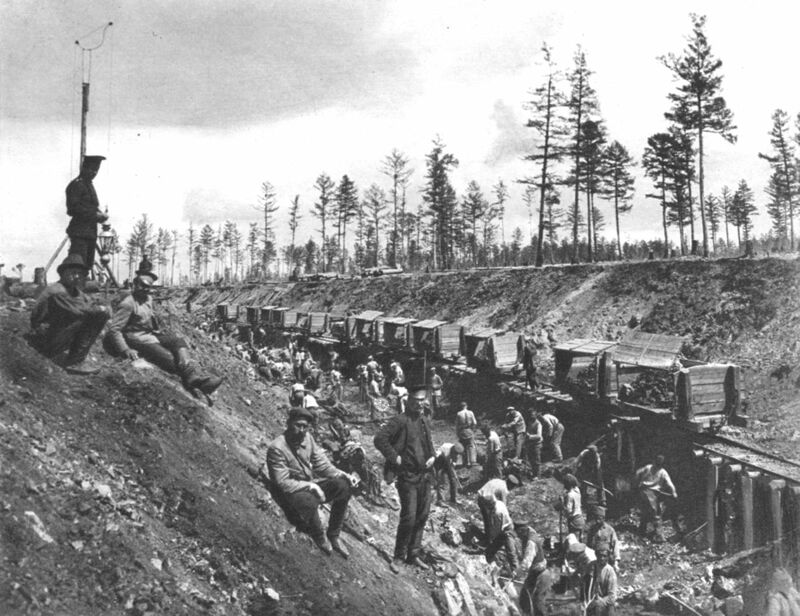 The construction of The Great Siberian Way, as Trans-Siberian Railway was then called, began on May 31, 1891. The railway and the process of its construction played a crucial role in the socio-economic development of the Russian Far East. Just 5 years after the construction of the railroad began, the cargo turnover of the Vladivostok port increased by more than 30 times. A significant amount of the imported goods were meant for the construction of the railway. With the commissioning of a railway track from the Pacific to the Urals, Vladivostok became the sea gate for a transcontinental railway.